It's been a good year for traditional heavy metal, and we end well with the debut release from Australia's Dragonsclaw. Conceived by Paindivision guitarist Ben Thomas, the band takes an aggressive, even epic, approach to classic heavy and power metal. Thomas is joined by his brother Aaron on bass, Ray Martens (Paindivision, Shock Therapy, Scoundrel et al) on keyboards, and New Zealand vocalist Giles Lavery, who recently has been tapped for the Australian Ronnie James Dio Tribute Show. To further align the stars more correctly, Blaze Bayley (Iron Maiden, Wolfsbane) and Allessandro Del Vecchio (Edge of Forever, Eden's Curse, James Labrie, et al) make guest vocal appearances. Production is covered by guitarist Stu Marshall (Empires of Eden). Nevertheless, Dragonsclaw's debut is a well-conceived and bombastic platter of speedy power metal. You might think its 1985 again. Recommended. 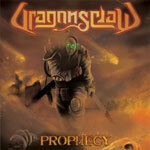 Dragonsclaw's debut is a well-conceived and bombastic platter of speedy power metal. You might think its 1985 again.